Many years ago, Mom planted these. "My own little harbingers of Spring!" she declared, and every year, when they bloomed, she would take a picture of them. Then, she would hurry into the house to call me, and I can still hear the lilt in her voice, that the green was coming back to the world, the days would stretch out in to summer again, and the cold, dreary days of winter would soon be banished. Over the years, they have multiplied on their own, and now there are several swaths of them running through the front garden, under the library windows. They wave their cheerful yellow heads at me in the morning, and it's almost like Mom is standing next to me, telling me about her plans for this year's plantings. I never used to give a second thought to them, or to any gardening really, but after Mom came to live with us, all of that changed. Her very first week back, we went to the garden center, and brought home an entire car full of plants and bulbs and containers. There were gardening gloves (because a lady never has dirt under her fingernails!) and spades, and fertilizer, and all of the accoutrement that seem to be required of a Good Home Gardener. She loved container gardening, and so now I have all kinds of huge pots ready to be filled with flowers and green things of all kinds. I know she despaired of me ever learning the difference between a perennial and an annual, but it matters not - I have grown to actually enjoy puttering around, moving plants to bigger pots when they outgrow their original homes, watering them, moving them from the shelter of the fence by the gate, out to the yard when the last frost has finally left for the north, along with the geese that winter here. I have a green thumb, and no one is more surprised than I am. Thanks, Mom. 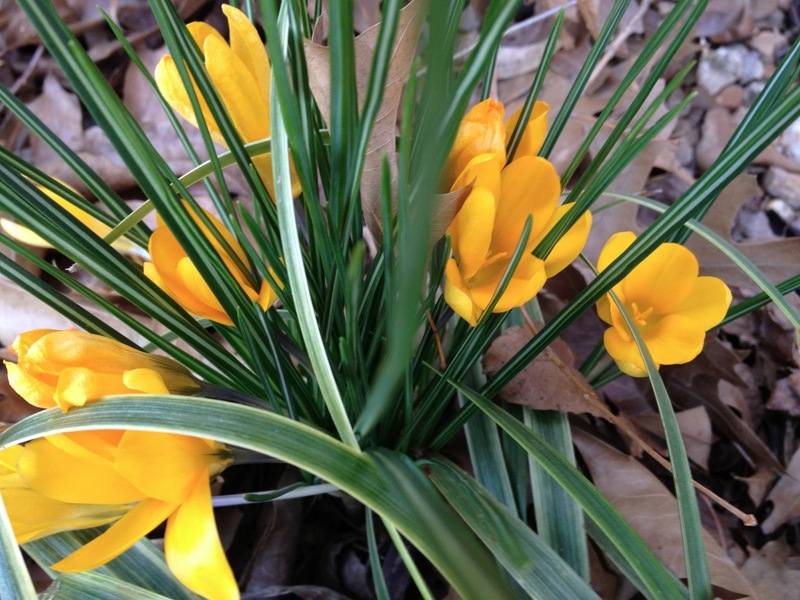 From me, and the little yellow crocuses. you're back! you're back? yay! missed you! LOL, yes it would appear that I'm back! Hey! I didn't know you were still blogging!